If you want an easy way to hold your growing digital library – files, pictures, music, and videos – Toshiba’s Canvio Basics 3.0 portable hard drives are a great solution, offering simple drag-and-drop storage that’s ready to roll right out of the box. It requires no external AC adapter and it’s Plug & Play compatible. Just connect it into the USB port of your PC and you’re ready to go. Future-proofed with USB 3.0 technology, the Canvio Basics 3.0 hard drive significantly improves the file transfer speed for large media files and dramatically minimizes the wait time for backup and recovery processes. Plus, it’s backwards compatible with USB 2.0 devices. Canvio Basics USB 3.0 portable hard drives are far faster than – but still compatible with – USB 2.0 technology. So you’ll still be able to plug into older PCs with USB 2.0 ports. 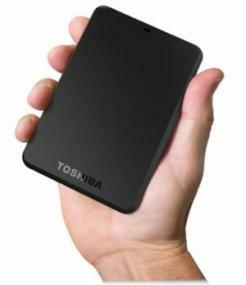 Toshiba’s Canvio Basics 3.0 portable hard drives deliver one of the easiest ways to add storage to your computer. One of the simplest storage solutions in a box, Toshiba’s Canvio Basics 3.0 offers plug-and-play, and drag-and-drop convenience.